Gathering with family, relatives and friend during the Halloween night could be a very special moment especially for children. Setting the home in a scarily fun way would really improve the party for the celebration. The place that should become your priority is the dining room and the best setting is on the dining table. There are lots of ideas we have that you can try. Then just follow this post and find your best ideas of Halloween Dining Table in our gallery. 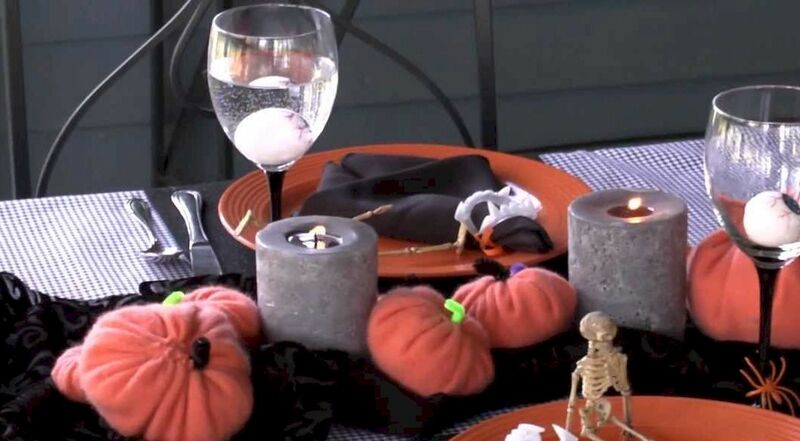 For your dining table during Halloween celebration, you can add some parts that better will cost you less. You can make the Halloween decoration from old candle holder painted in black and using black candle to illuminate your ghostly dinner concept. Making some pumpkin decorated with dried stick and branches collected from the garden will really add some effect to you table. You can also use black table sheet that can make some nice gothic accent while combined with those stuffs. If you need more silent touch, printing some horror poems on black paper is really good ideas to have nice horror sense. For the cutlery sets, pick the colors that synchronize with the table style. Black, red, white will be nice to join the supernatural cult in your dining table. Just check the following galleries for more ideas about Halloween dining table.